As we are already well into 2019, we are reflecting on our past great travels and planning new land and cruise holidays for the months and years ahead. It was a privilege and a pleasure to personally meet and travel with many of you this past autumn. We had a great adventure travelling to central Europe despite record low waters on a river cruise immersing ourselves in its history and seeing history in the making as these countries continue to rebuild from the communist era. Personally, I was proud to share Cracow and Warsaw for sentimental reasons. Poland is a true hidden gem in Europe and you will be pleasantly surprised and impressed how Warsaw has been restored as a very modern and elegant capital city. 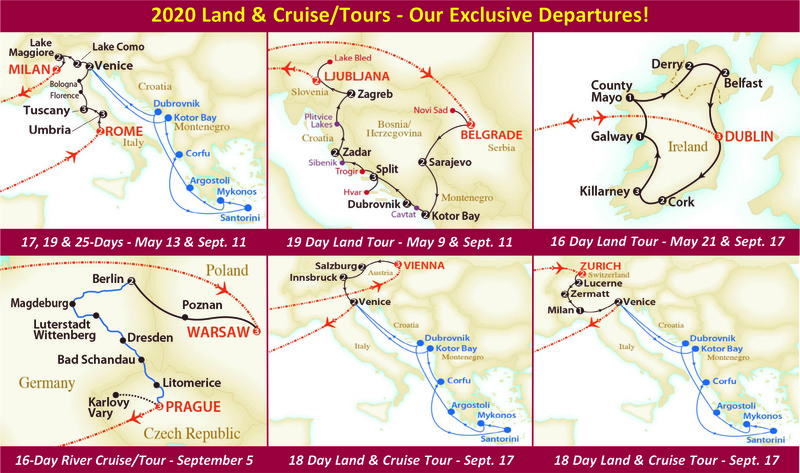 Come and join us on a similar package departing on September 5, 2020 from Warsaw to Berlin and then on to Dresden and ending in Prague. I followed this trip with my next group to Ireland and Scotland. It was such a contrast to the heat wave of central Europe to the cooler days on the Emerald Isle and it’s green countryside. This was truly an unforgettable experience for this group of travellers who enjoyed the charm and knowledge of our private guide. His great sense of humour and amazing expertise made the history of this region come alive and instantly relatable. I’m looking forward to having him as our guide again for our Ireland coach tours departing in 2020 and I am sure this will make your tour of Ireland even more enjoyable and certainly memorable. I invite you to travel with us in 2020 on our new President’s tour with a new exciting itinerary to the Balkan region visiting Serbia, Montenegro, Bosnia-Herzegovina, Croatia and Slovenia. This is certainly a region that should be on everyone’s bucket list as we explore ancient cities and many unique and beautiful sights of this area. It includes most of your meals with local wines. Reserve your space soon, as I am sure that this will be one of our very popular land tours. In 2020, we have many brand new land tours to Italy, Austria and Switzerland that will also include a cruise sailing round-trip from Venice. Explore Italy with multi overnight hotel stays in Rome, Umbria, Tuscany and Venice visiting many picturesque hilltop towns as well as the beautiful Italian lake district and Milan. Perhaps, a coach tour to Austria or Switzerland is more to your preference as both tours will take you through the heart of the Alps with a wide variety of cities in each country along the way. Once again, each coach tour will conclude with a 7-night cruise from Venice to the Greek Isles and Adriatic coast. After your busy and exciting land tour sightseeing, it is a perfect way to have a relaxing cruise and a chance to add and explore Southern Europe before coming back home from a great holiday. If you are looking forward to escaping our next Canadian winter, we still have availability for the winter and spring of 2020 to many exotic destinations such as our 22-day South Africa, Victoria Falls and Chobe land adventure or our 27-day Australia and New Zealand grand cruise tour package departing on February 8, 2020. You may also wish to consider our 28-day Arabian Odyssey from Rome to Dubai departing on February 7, 2020. If Asia is on your bucket list to visit the iconic cities of south-east Asia and Japan then join us on a 22-day cruise/tour departing on April 12, 2020 as we cruise from Singapore to Tokyo, Japan. Travel in style and comfort with our exclusive African train adventures to South Africa, Zimbabwe, Mozambique and Namibia in the winter/spring of 2021. Your train is your home base as you explore the excitement of safaris, unique cities and villages that are included as part of your excursions. You will also enjoy first class pre-train journey hotel stays in Cape Town, Johannesburg, as well as in Victoria Falls and Swakopmund, Namibia. I urge you to reserve your space soon on one of these amazing African journeys as they do sell quickly due to the popular destinations being visited on the African continent. I invite you to peruse our website for all our offers that that will take you to many unique and exotic destinations around the world.